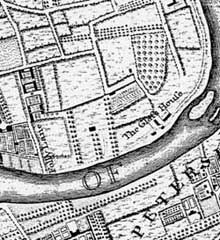 John Rocque's map published between 1741 and 1745 shows a property beside the River Thames at Twickenham prominently labelled The Glass House, which appears to consist of a number of buildings. It is not clear why this property was chosen to be named in preference to the various important estates in the immediate neighbourhood such as Ham House, Orleans House, Marble Hill or Cambridge Park. The land now forms a part of what is now Marble Hill Park, at its south-east corner. The earliest reference to this property yet seen is an entry in the parish rating assessment of 1652 when it was apparently in the ownership of Sergeant Edward Birkhead, he being behind with his payment of 4/- for "ye glasse house". In 1656 John Clarke was paying rent of 2/-. In the 1661 Survey of the Parish it was still in the ownership of Birkhead and described as "The Glasse house that Trotts lives in" (James Trott had been a Churchwarden in 1643). It was valued at £6, a sum indicating that it was more extensive than a cottage. Later occupiers of this property include a Mr Bright from 1674-77 and Richard Watkins in 1675. At a Vestry meeting of 15 February 1674/5 it was "ordered that Mr Billinghurst doe draw Covenants for ye undertakers of ye glassehouse & a bond of £1000 to make good ye covenants & that ye officers be careful to see ye deeds sealed". Mr Billinghurst's name occurs elsewhere and he appears to have been a lawyer, recorded as living in Whitton between 1672 and 1679. Another reference, in the Churchwardens' Accounts for 1675 reads: "paid to John Rogers for going to London to ye masters of ye glasse howse to give in [?security], 4/-". This may have been the Worshipful Company of Glass Sellers. At about this time the property may have come into the hands of Robert Bartlett (?baptised 10 August 1651, described as a tallow chandler of Southwark son of Robert Bartlett the younger) whose widow Sarah inherited land in the immediate area on his death in 1719. The property, drawn as several buildings, is described as the hatters on a plan ("Scatch of the Grounds at Twittinhame…") drawn by the Earl of Mar in 1711. This description cannot be explained: it may refer to the owner or use of a part of the property. References to later occupiers, or proprietors, include a Widow Lane in 1718 and 1720, a Mr Swain between 1725 and 1734, William Plomer (a linen draper) in 1738. Plomer was a son-in-law of Sarah Bartlett; he died in 1747 and, in 1748 a Mr (?William) Toothacre. Mrs Toothacre was noted for 1749 and she may have been the widow of William, buried on 16 October that year. In about 1750 the Glass House buildings were probably rebuilt as two small houses. One of these was occupied by John Fridenberg as a neighbour of the Countess of Suffolk, being ejected following a dispute about access, in about 1757. The other was later named Little Marble Hill. The evidence for the existence (and duration) of a glass-making works is circumstantial, preventing a definite conclusion although the description Glass House was normally used for a glass-making factory. The Manor Court Books do not note such a business here although there are references to land described as the "Glass House Mead". The property may have been enfranchised as freehold, acquired by the Countess of Suffolk through the agency of the Earl of Islay who was instrumental in putting together the land for the Marble Hill Estate from 1724. Such a site, well away from other buildings, would have met concerns about the fire hazard and smoke pollution associated with glass manufacturing. In London there was, at the time, an Act preventing glass houses from operating within a mile of the Palace of Whitehall. Note: The Glass Excise Act of 1745 penalised the manufacture of heavy (drinking) glassware, imposing a levy of 9/4d per Cwt (112 lbs) of ordinary glass and 2/4 on each Cwt of green bottle glass. The Act was very unpopular, leading to the licensing of each Glass house for an annual fee of £10 by 1784. The glass excise was abolished in 1845. According to John Serle's Account of the MATERIALS which compose the Grotto, published in 1745, the tunnel (2 & II) then contained "several Pieces of well-chosen things from the Glass-House". Also, in the rear chamber (9 & IX) there were "Cinders, from the Glass-houses, Furnaces, &c..." It is believed there is coloured glass in the Marble Hill House grotto, possibly from a local source.